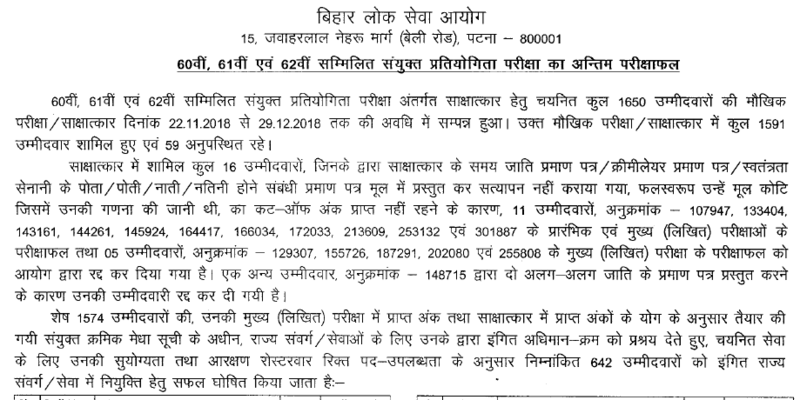 Bihar Public Service Commission has declared Result of the 60th, 61st and 62nd final exams of Bihar Public Service Commission, check Result and cutoff here. BPSC Combined Joint Competition Examinations Result: Bihar Public Service Commission (BPSC) has declared the final result of the 60th, 61st and 62nd combined Joint Competition examinations. A total of 1650 candidates were selected for interview from all three examinations. BPSC conducted interviews from 22nd November to 29th December 2018. Following the final result released, a total of 642 candidates have been declared qualified in the final result. All 642 candidates will be recruited in various services of the State Government. Candidates who appeared in the interview can check their final result from the link given below.